12 Febraury 2018 The story of painting has become, in large part, the story of its response to other media, especially photography. That used to lead to lead to questions about whether painting would survive, but we seem to have got beyond that. Now the obvious question is how it relates to the online world and the proliferation of social media. Facebook, for example, started in 2004 so children born this century will have been interacting online since childhood. No doubt that will affect the art their generation produces, but what of artists already at work? Some painters have responded directly, for example Richard Prince and Michael Williams. But indirect approaches are also possible. Painters have emerged who play an awareness of the streaming prolixity of images and stories into painterly concerns which remain equally rooted in day to day life and art history. That yields an approach which is conscious of the online world but chooses not to foreground it in formal terms. The result is a fresh form of colloquially-driven narrative. There’s something of that spirit in Rose Wiley, Ansel Krut, Lisa Yuskavage, Magnus Plessen, Ryan Mosley, Jana Euler, Katherine Bernhardt, Dana Schutz and Jordan Kasey, for example. Perhaps that positioning is most likely for artists in their thirties: a unique generation, quite probably, for whom the online world is natural without it having been the dominant part of childhood; and for whom painting was a straightforward rather than charged choice of medium at art college, as it wasn’t during the perpetual debates about its status in the preceding century. The way is open for a painterly post-digital vernacular to develop, and two of the most impressive in that mode are currently showing in London: Dale Lewis, who has risen to prominence and gained an international profile over the past year, at Edel Assanti (‘Fat, Sugar, Salt’ to 10 March) and Emma Cousin, with her first big solo show at Lewisham Arthouse (‘Leg Up’ to 18 Feb). Though their careers are at slightly different stages, they have much in common. Neither can be slotted into the macho-male tradition of painterly assertion: Lewis is gay, which indeed seems to facilitate a particular abandon in his depiction of women, on whom Cousin concentrates with a comparable freedom. Both work at scale so their figures are often life sized, and Lewis in particular has found his distinctive voice over the last couple of years at a widescreen horizontal format of 2 x 4 metres. Neither use photographic sources. Both are open fans of the Renaissance, and you can see it pretty directly in their work. The underlying composition of Lewis’s works tends to come from the National Gallery, explaining how he combines structural clarity with spontaneity. Cousin cites how Pontormo, Tiepolo and Poussin feed into the shapes of her figures and her choices of colour. Both spent much of their twenties in the more measured end of the art business, contributing perhaps to the vertiginous sense in their work of having been freed from constraints: Lewis was assistant to Raqib Shaw, painting with exacting detail; Cousin worked for the secondary art dealer Robin Katz. Both concentrate on the figure, whether in groups or with a dominant individual – though Cousin also operates synechdotally, using a ‘language of legs’ to stand in for the whole person. Both make paintings packed with incident and content. There’s an immediate hit, for sure, but there’s also plenty available to decode. And there’s always a dash of colloquial wit, boosted by the matching informality of the painterly language. 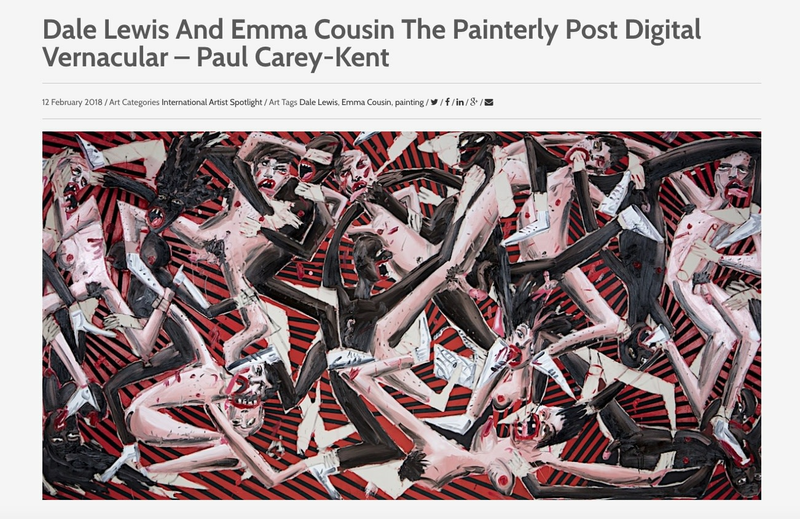 That often feeds into their titles: Cousin’s Running Scared repurposes a stock phrase to describe figures who, ‘although propelled’, as she puts it, ‘remain motionless’; and whatever the juice may be in Lewis’ Devil’s Juice – drugs, Southern Comfort or paint? – it’s the cause of a pub brawl sufficiently gloried in to allow for an orgiastic reading. The ‘action painting’ in that fits how Lewis paints: at speed, straight from the tube while the paint can be moved around – sometimes completing a painting within one flat-out day – and preferring to keep a sense of urgency and semi-accidental discovery rather than ‘tidy up’. The big difference lies in the source of their vernacular visions. Both use the personal to reach the universal, but from different directions. Lewis is primarily an observer: he generates his multi-figure tableaux, ordered by classical principles, from the quick-fire notations he makes around the streets. ‘In London’, he says, ‘you only have to take a walk, a bus or a tube journey and you’ve seen a whole host of people and scenarios that could make it into a painting’. Lewis adds in his own memories, often from childhood, of what affected him emotionally. Sometimes he’ll appear himself, in that remembered role, but I read him as outside looking in: onto the social and geographical scene around him, onto his own past. Cousin, in contrast, inhabits her characters. They’re not self-portraits as such, but they do present the inner experience of being a woman in society now – how it feels to be in a social female body – so that they take on a common relevance. Lewis’ most recent paintings originate in his daily walk through London’s East End, from his flat in Leyton to his studio in Bow. Here we’re in Morrison’s supermarket, posited as a scene of exotic ethnic and culinary diversity. Lewis has fun with the pineapple, creamy avocado, fried eggs and a goat’s head (a.k.a. ‘Hoxton Chicken’, from when Hoxton was a poor area). He playfully imports an upside-down child from the playground, and a more disturbing figure who seems unaware of her exposure. It builds to an upbeat view of how to get on with life in the face of deprivations. Set aside the subject and this is a formal winner as tilt meets stripes a la Daniel Buren meets a device whereby the car’s windows are delineated but we can see the whole interior. But it is an insistent subject, its head-on engagement with potential embarrassment arising, says Cousin, from personal experience when caught short in her favoured outdoor activities such as climbing and running. Then, despite the deft aiming of the extra yellow stripe, it would be much simpler to be a man. So ‘Peeing at 80’ can – as Luce Garrigues proposes to Cousin in the show’s catalogue –be read as a female existential statement: how can a woman perform the most natural task in a society led at full speed by men? En Masse fits various types together: a washing-up-gloved mother, shrinking into a floor of restricted activity as she cradles her baby; a gymnast-come-doll; a booted submissive; a new age meditator with trendy blue hair; an over-eater, who arches over the set-up even as she enacts her own version of ‘having it all’. Behind a jauntily energetic surface, as society requires, lies a rum set of choices set up to compete as possible facets of a self.